Visitors arriving in Reykjavik on Thursday morning were greeted with a wall of brutal cold rain and wind which then miraculously broke minutes later to reveal intense rainbows that appeared as if from a child’s kindergarten finger-painting, thus summing up the experience of Iceland. Isolated in the middle of the Atlantic Ocean with vast empty spaces and a small population of 320,000, yet revealing an artistry that is enamoring and without precedent, Iceland has somehow managed to be one of the cultural curiosities of the world, offering a unique richness of music and film. The Reykjavik International Film Festival is a part of this celebration that continues this week. Now in its fifth year, the festival kicked off last Thursday with ten days of films from around the world, filmmaker master classes, panels, and tours around the gorgeous landscape of Iceland. Friday was the evening for Iceland’s filmmakers to shine with an intimate event which offered a preview of some of the new films in production by Iceland’s top filmmakers. Icelandic Film Centre Director Laufey Gudjonsdottir started things off by noting that funding has been secured between filmmakers and the government throughout 2010. 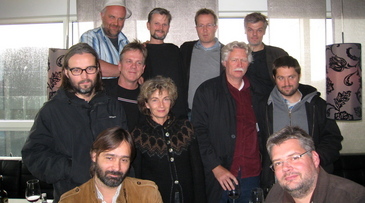 Iceland’s most well known filmmakers were in attendance, including director Baltasar Kormakur, whose recent films “Jar City” and “White Night Wedding” received much attention here in Iceland, with “White Night” as Iceland’s official submission this year for the foreign language category at the Oscars. Kormakur teased his latest project, “Run For Her Life.” Shot in New Mexico and starring Diane Kruger and Dermont Mulroney, it explores the world of “organ tourism” when a couple go to Mexico to find lungs for their sick daughter. Not surprisingly, the tight knit Icelandic film community offers a lot of crossover between artists, with Kormakur also serving as lead actor in Oskar Jonasson‘s film “Reykjavik-Rotterdam” where he plays an alcohol smuggler who illegally brings in the terribly expense and much desired vice from Rotterdam to Reykjavik. Fridrik Thor Fridriksson, who directed the mid 90’s indie hit, “Cold Fever,” was also in attendance and showed off scenes from “Sunman,” his documentary that tackles the subject of autism in children. Fridriksson said that he started making the film at the request of a Mother of an autistic son who felt there was no hope of a cure for her son but hopes the film will make it easier for autistic people. Fridriksson admitted he didn’t know anything about autism initially, but feels his film will offer a lot of healing power on a universal scale that people can relate to, regardless of their adversities. Another documentary, Thorfinnur Gudnason‘s “Dreamland” takes a look at the much-discussed issue of Iceland’s environment. Based on a best selling book that was a huge influence on the population, “Dreamland” rekindled a debate about whether Iceland should become one of their biggest smelters of aluminum and the issues of maintaining the pristine untouched gorgeousness of the Icelandic landscape while also supporting the small, isolated country and its population of 300,000, which maintains one of the highest standards of living in the world. The environment is obviously heavy in the minds of Icelanders, and the “World Changes” section of the festival offers eleven films that explore this issue, including “Flow: For the Love of Water,” Irena Salina‘s Sundance doc about the how water is used around the globe and is being quickly depleted, and another film about water that also premiered at Park City, “Up the Yangtze,” which takes a look at how a poor family in China is being driven out of their home by the construction of the Three Gorges Dam. The most dramatic way to prove the point of how precious and integral the environment is to Icelanders was shown to visitors on Saturday with a bus tour of the gorgeous, isolated Snaefellsnes peninsula, which offered amazing views of lava formations, craters, a beach covered with black sand, and vast, flat landscape created by lava flow and covered with slow growing moss. The festival also offered up a few premieres, including Asthildur Kjartansdottir‘s “That’s What I call Dance,” a doc about award winning modern dancer Erna Omarsdottir. Unfortunately, English subtitles were not provided, but the film still features footage of Omarsdottir performances and her riveting, energetic, bizarre style that brings to mind David Lynch movies and the “The Exorcist.” T.C. McLuhan‘s “The Frontier Ghandi” also made it’s first screening at the festival, and tells the story of Badshah Khan, who was the Muslim version of Gandhi and fought for peace in Pakistan’s North-West frontier.